CUA CHIM – This blog is for a cohort of students in Cultural Heritage Information Management course of study at the Department of Library and Information Science at the Catholic University of America in Washington, DC. Exhibitions are a phenomenal tool that an archive and information center can use to introduce the public to its collection. Exhibitions are especially effective because they offer a point of visitor engagement with collections and convey the institution’s mission. (Gaub 2011, 127.) For my CUA LIS course on Public Programs, Outreach, and Digital Exhibitions, each student reviewed an exhibition at a local institution. 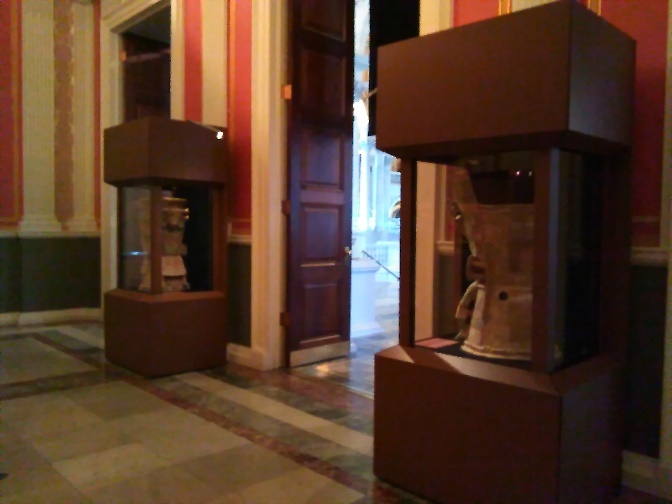 Upon reviewing “Exploring the Early Americas,” at the Library of Congress, I understood how exhibitions can be an effective form of outreach when the relationship between visitor, collection, and institution is considered. So what makes a good exhibition? Author Emma Howgill argues for several criteria in her article “New Methods of Analyzing Archival Exhibitions.” Comfort and physical accessibility, for instance, are basic measures that exhibitions can use to draw visitors in or shoo them away (Howgill 2015, 2, 8.) Organization is another critical component, ensuring that objects are presented in a coherent narrative for the visitor (Howgill 2015, 2-3.) Intellectual accessibility and interactive learning also enhance the visitor’s experience. “Exploring the Early Americas,” the exhibition I chose to evaluate based on Howgill’s criteria, offers a glimpse into the Library’s collection of over 3,000 rare documents, maps, and objects relating to the early Americas and the Age of Discovery. As a library science student with an interest in rare collections, I learned that exhibitions can make rare materials and institutions that care for such collections more accessible to visitors. Howgill’s first set of criteria encompasses comfort and physical accessibility, which this exhibition attempts to achieve. The Jefferson building, where the collection is exhibited, is an old building with little leeway for modification. The exhibition adapted to the space and even added some pre-Columbian flair, flanking the entrance with statues and an arch (Figure 1). While the exhibition was well-designed, there were some concerns that modifications could not address. For instance, the large windows had to be shuttered to ensure proper preservation standards, leaving case lights that were barely bright enough to read the object labels (Figure 2). Additionally, the room was set up so that visitors would enter and exit through the same corridor. Despite this, the exhibition negotiated its given space well and provided a lovely setting to amble through. Organization is perhaps the next level on a hierarchy of needs for exhibitions, as a poorly-designed and organized exhibition will fail to achieve the institution’s goal of advocating for itself and its collections. The Library of Congress did not disappoint, and instead organized “Exploring the Early Americas” with such a goal in mind. The themes discussed early in the exhibition, such as “Pre-Contact America” and “Explorations and Encounters,” crescendo to the final theme, “Aftermath of Explorations.” In this last room, visitors encounter the Waldseemüller maps, a recent high-profile acquisition for the Library of Congress, and the first instance of the name “America” appearing on a map. 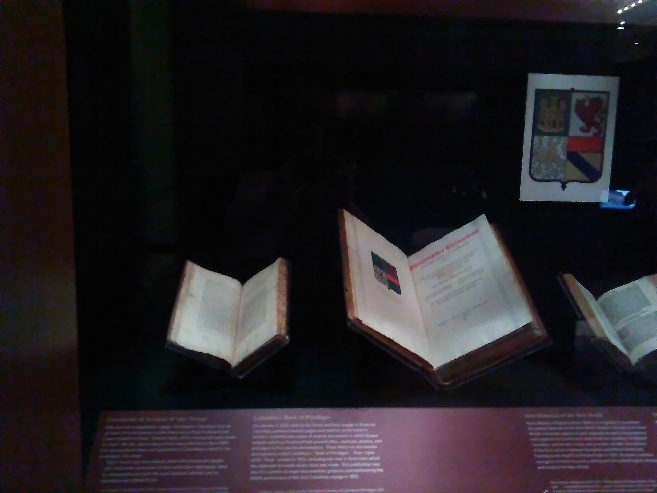 In addition to structuring the exhibition around these archival gems, the Library of Congress exhibits many other pieces within its collection to show how they are being used by scholars. Intellectual accessibility, the third component of Howgill’s criteria, invites the visitor to engage with the objects and content in an appropriate manner. My fellow exhibition-goers were students and families who had just wrapped up their tour of the Library; certainly pre-Columbian history was not their specialty. However, wall texts and object labels ferried them through the content, and interactive components complemented them. 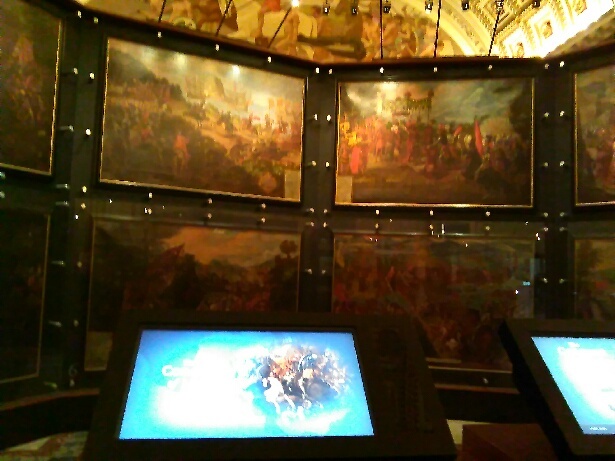 Interactive kiosks lined the hall, some with brief videos about how scholars use the collections, others with digitized versions of objects that visitors could browse. The two latter components, intellectual accessibility and organization, go hand in hand, allowing visitors both to learn about pre-Columbian history, but also to understand why the Library of Congress even has these materials in the first place. Through wall text, interactive kiosks, and exhibition organization, visitors appreciate the value of archives and libraries as scholarly support systems. “Exploring the Early Americas” goes above and beyond a basic exhibition, and I would encourage exhibition planners to use this exhibition as a model for exhibiting objects as an outreach tool. Gaub, S. (2011). “Visual materials.” In Russell D. James & Peter J. Wosh (Eds. ), Public relations and marketing for archives (109-159), New York: Neal-Schuman Publishers, Inc.
Howgill, E. (2015). New methods of analyzing archival exhibitions. Archives and Records, 1-16 (June 2015). This August I had pleasure of attending the Society of American Archivists (SAA) Annual Meeting, ARCHIVES 2015, in Cleveland, Ohio. While I was excited enough by the prospect of participating in my first national LIS conference, I was most looking forward to learning about recent trends and practices in digital archival outreach and engagement. Having spent my summer practicum doing social media and digital outreach at the Smithsonian Institution Archives, I was eager to contextualize the experience within contemporary archival scholarship. Through discussions, professional posters, and one absolutely stellar panel, it became clear that successful outreach is an increasingly subtle, calculated art. At Emory University’s Manuscript, Archive, and Rare Book Library (MARBL), outreach archivist Matthew Strandmark has been implementing innovative strategies for achieving community relevance and engagement. With these outreach goals firmly outlined, Strandmark was able to develop a carefully crafted and instituted MARBL presence on the platform HistoryPin. The magic of HistoryPin is its interactive capability which, through a variety of features, promotes the creation of collaborative community history. MARBL uploads a variety of archival images, tagging their location and date, and even giving some the ability to layer over contemporary street view shots of the same site. Community users contribute context and emotional value by adding personal comments and stories to the photographs. Staff at Philadelphia’s Othmer Library of Chemical History have experienced similar success leveraging the unique capabilities of a single social media platform. Searching for the best, and most efficient, way to enhance the visibility of their obscure institution, Hillary Kativa and her coworkers created a Tumblr blog, Othmeralia. Tumblr gives staff the ability to pair visual content (like GIFs, scanned archival content, and digital photographs) with any length of explanation, from essay to cheeky caption, depending on the situation. Other great Tumblr features are content tagging and reposting—capabilities that led to an Othmeralia shout-out from Smithsonian Libraries, and the subsequent heightening of the blog’s visibility. Othmer’s approach is an exceptional outreach model for hidden archives and collections across the world, while its content is a great example of how such singular content can be re-framed in a way that renders it relatable to most user groups. The last approach I encountered, “narrowly focused” digital and social media outreach, was directly offered by session panelists as an experimental alternative to classic strategies. This approach is typified by digital/social media initiatives developed specifically for showcasing an exceptionally rich, high-profile, or heterogeneous institutional collection. Outreach staff may choose a single digital platform that meets engagement goals, or they may go cross-platform to enhance visibility; this decision depends on how they can best reach the collection’s specified target audience. The Documenting Modern Living: Digitizing Miller House and Garden Tumblr blog, operated by the Indianapolis Museum of Art, is a wonderful narrowly focused outreach project. The collection, a home, surrounding gardens, and related archives, is highly visual—including paint samples, architectural sketches, historic and contemporary property photos—making Tumblr a perfect platform for exploring its in’s-and-out’s. It’s surprising how effective this narrowing strategy is at achieving profoundly deep-seated engagement with users. All of these aforementioned digital engagement initiatives indicate a burgeoning approach to archival outreach that is marked by creativity, dynamism, and experimentation. But the more notable trend exhibited is the careful “tailoring” of strategy and digital medium to the unique engagement end-goal(s) of each institution. Until recently, the common digital outreach M.O has been a cross-platform approach most often served by the social media “big four”: Facebook, Twitter, Instagram, and preferred blog service. Such multi-strategies are great user-community “catch-all’s” as, between four platforms, most user demographics are bound to be reached. The problem, though, is the unsuitability of cross-platform approaches to sparking deep, sustained user engagement. In other words, these strategies are great for pairing with a dynamic, enticing institutional website or additional digital service but, alone, they aren’t adequately fitted to institutional goals to be sufficient standalone methods. The outreach work of these ARCHIVES 2015 presenters is exciting because it represents a potential shift in digital engagement approaches, proving that social media platforms and technologies beyond the “big four” can indeed be worth the investment of resources. It is absolutely essential to note that these tailored digital outreach initiatives are only worth the investment if the institution truly possesses the time, knowledge, technology, and manpower required to create a well-developed, goal-oriented implementation strategy. All digital outreach is best served by a strategic plan, but the success of this fitted approach is especially contingent on planning, as the entire initiative begins with mapping specific outreach goals to the best-suited available social media/digital platform. In the future, as increasing numbers of cultural heritage organizations explore the creation of unique, platform-specific tailored outreach, it’s likely that best practice formulas will emerge. Five years down the road, outreach professionals may be able to plug their institutional information and engagement goals into a formula that spits out the bones of a tailored outreach strategy-complete with best-suited social media platform and all! But whatever professional workflow emerges, one thing is certain: with creative outreach and engagement professionals—like those mentioned here—continuing to dominated the LIS field, anything is possible. The Department of Library and Information Science at the Catholic University of America will be hosting the Cultural Heritage Information Management Forum on June 5, 2015. This year’s Forum will include a poster session. Call-For-Posters: Cultural Heritage Information Management Forum at the Catholic University of America, posted on January 31, 2015, outlined the specifications for submitting poster proposals to the Forum Planning Committee. Since the original press release, the CHIM Forum Planning Committee has elected to officially extend the poster proposal submission deadline to March 15, 2015. All subsequent call-for-posters announcements and related information releases will reflect this change. All other “important dates” related to the Forum and call-for-posters remain the same, including the March 23, 2015 notification of proposal acceptance. For more detailed information on submitting a proposal, please refer to the original blog post. Those seeking further details about the CHIM Forum itself may refer to the event website. As always, questions and concerns can be answered by contacting the CHIM Forum Planning Committee. Important Changes: Deadline for poster proposal submissions has been changed from March 2, 2015 to March 15, 2015. Keynote speaker Superintendent of Documents Mary Alice Baish’s update on the changes underway at the recently renamed Government Publications Office, and the future of government information. Panelists and speakers sharing experiences and insights from across the spectrum of librarianship, from School Library Media to Law Librarianship and more. Lunch and poster sessions that provide opportunities to catch up with old friends and make unexpected new connections. As the National Capital region’s only regional symposium featuring diverse contributions from your local colleagues, and at an incredibly affordable $25, this is a “don’t miss” event! For more information, visit the Symposium’s homepage. To register now, please visit the event registration portal. CUA Library and Information Science students are eligible to have their registration fee supported by AGLISS! Simply register for the Symposium, using this form, by Friday, February the 6th, and you will be registered for free, courtesy of AGLISS. Once you’ve requested the registration fee waiver, AGLISS will verify your current enrollment as a CUA LIS student and send you a confirmation message. The posters for the CHIM Forum are refereed. Poster presenters will participate in the lightning talk and have time to discuss their posters with fellow Forum participants over lunch. Presenters will have many opportunities to interact with the audience and receive feedback on their projects. Since space for poster display is limited, please submit your poster proposals by the deadline, March 2, 2015. For further information about the CHIM Forum please visit the event website. The site will be updated as new details become available. Please email your poster proposal to the Planning Committee at cua-chim-forum@cua.edu by Monday, March 2, 2015. Your poster proposal submission will be acknowledged within 24 hours after submission. Notification of acceptance will be sent on March 23. Poster presenters are responsible for printing the posters and mounting them for display at the CHIM Forum. Poster presenters must register for the CHIM Forum. Registration is free and includes lunch. You will be alerted when registration opens. Please contact the Planning Committee at cua-chim-forum@cua.edu if you have any questions about submitting a poster proposal.